The Samajwadi Pension yojana is one of the schemes that are launched by the government of Uttar Pradesh for encouraging the savings of people who are living below the poverty lines. The yojana is target towards a financial assistance for the BPL people. This scheme is also known as Uttar Pradesh Samajwadi Pension Yojana. This pension scheme is focused on offering a financial assistance for almost 40 lakh rural people and this is going to replace the existing pension scheme prevalent in UP which is called Rani Laxmi Bai pension Yojana. Any family that is living below poverty level can make application for this scheme. A valid proof of residence should be shown to the government authorities or financial institutions from where the Samajwadi part pension is obtained. The scheme offers a monthly pension of Rs 500 to every rural family and the amount of pension is increased by Rs 50 for every financial year. The maximum amount of pension limit that is offered by Samajwadi party pension yojana is Rs 750 and selection of families shall be done at gram Panchayat levels. All the districts within UP are covered in this scheme. For the application of Samajwadi party pension Yojana, any family member is eligible to apply as long as he/she is enlisted to the BPL. The online application for this scheme is accessible within the official website of the Samajwadi Party pension Yojana which is http://sspy-up.gov.in/. The application needs to be done by the following steps. Log in to the official website mentioned above and then click on the link of downloading the Samajwadi pension Yojana online form. Complete filling up the form and then upload it along with all the required documents. The UP government’s Samajwadi party Yojana card shall look similar to the Passbook of a bank in which the details shall be provided. Eligible people from the different districts can fill up the application form and submit them. And if you are among the applicants who are looking for you name within Samajwadi pension yojana list 2016, then please go through the following steps. The first step is to open the legitimate website of Samajwadi pension Yojana which is http://sspy-up.gov.in. 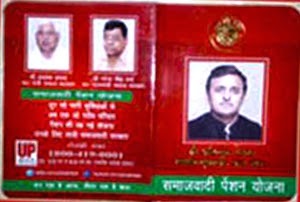 Now you have to open the link of Samajwadi party. You shall reach the index page of the above mentioned link and then you shall have to open the page named “pensioner Soochi”. After that you reach to the link of http://sspy-up.gov.in/SamajwadiPension/OAPReportDistrictVise.aspx and now you have to select the District and then click on Block and then again click on Gram Panchayat. Here you see the Samajwadi party Pension Yojana Beneficiary list of 2015 along with your complete details like father’s name, bank name, branch name, account number with the rupees that have been allotted and also the status of the account. The funds shall be sent directly to the account of mukhiya or guardian of the family on a monthly basis. The beneficiary pensioner family needs to be educated. Select for the pension Suchi of that particular year.